Yes, it's true -- here are more photos from Abu Ghraib that the American press will certainly refuse to publish, because they demonstrate just how depraved and insensitive American troops can be. 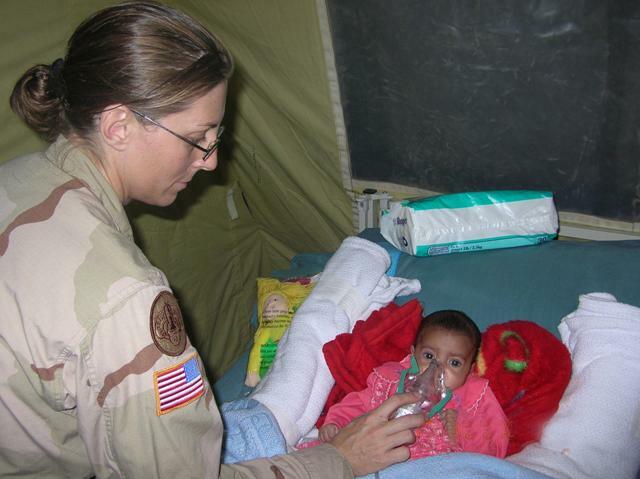 Maj. Lisa Flynn MD provides oxygen to Tabark Addul Rahman, aka Baby Tabitha. physician for the baby. Photo by Maj. Brad Wenstrup 344th Combat Support Hospital. There's more. Go check 'em out, if you don't mind getting angry at the unfeeling callousness of Americans at Abu Ghraib.